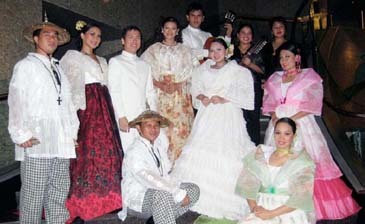 Members of the Philippines' Kalilayan Folkloric Group. Seeing Busan area as still a largely unexploited source market, the Department of Tourism (DOT) has called on travel and tour stakeholders, entrepreneurs, hotels, resorts, airlines and transport services to join the 11th Busan International Travel Fair that opened on Sept. 5 at Busan Exhibition and Convention Center in the southernmost port city of the Korean peninsula, some 450 km southeast of Seoul for a five-run. The highlight of the DOT's schedule at the Philippine pavilion is unique cultural performance of of Kalilayan Folkloric Group (KFG). It was the one event that Busan had eagerly anticipated their "Dancers for Freedom" musical show. "The spirit of cultural exchange will successfully propel the DoT's efforts to attract more Korean tourists to the Philippines through valuable initiatives like this cultural performance," Ms Maricon Basco-Ebron, tourism director and attaché at the Embassy of the Philippines in Korea said. The DOT is looking into the possibility of tapping more outbound tourist market segments in Korea’s provincial areas including Busan, Kwangju and Daejon, to name just a few. The term Kalilayan, an old name of Tayabas (now Quezon Province), is a fitting name for this folkloric group that traces its humble beginnings in Quezon and promotes the rich traditions of the region. Formed in 1997, KFG is composed of talented locals from Catanauan, Quezon that seeks to preserve Filipino folk dance and music through the performing arts. "Our presence in this regional travel trade fair sustains our drive to bring in Busan and its neighboring provincial market, which remain one of our highest spenders." Led by founder Rommel P. Serrano, the Kalilayan Folkloric Group is a proud recipient of many awards and citations. A former member of the Ramon Obusan Folkloric Group, Rommel formed the Kalilayan Folkloric Group from among dedicated students of the Manuel S. Enverga University Foundation in his hometown, Catanauan. Beyond entertaining different generations of Filipinos with folk dance and music, Rommel and the rest of the Kalilayan Folkloric Group members hope to inform and inspire the audience on the vibrant but vanishing culture of Filipinos. In this modern age where the Western way of life dominates indigenous cultures, the Kalilayan Folkloric Group believes that by promoting Philippine folk songs and dances to Filipinos, it can contribute in protecting the fading cultural traditions of the country. Kalilayan Folkloric Group's most important contribution is the wholistic growth of its members who at their young age are exposed to the colorful roots and traditions of their province and country. By dancing to Filipino folk music, the young members from small town Catanauan learn to appreciate their national identity and culture and develop pride in their heritage. Undergoing rigorous training, the young artists are also taught the value of perseverance and discipline, making each performance a winning result of their hard work and commitment. The Fair will facilitate exclusive meetings with travel specialists, five-star hoteliers and luxury tour operators. . The Fair looks into the world of travel and culture, with about 150 participating companies from 30 countries. Last year, the fair witnessed over 60,000 footfalls and this year expects an estimate of over 70,000 visitors.